By Sia in Mobile. January 30, 2017 . Tethering your Android device may no longer be a hassle in the near future as Google has released a new feature called "Instant Tethering" with version 10.2 of Google Play Services. 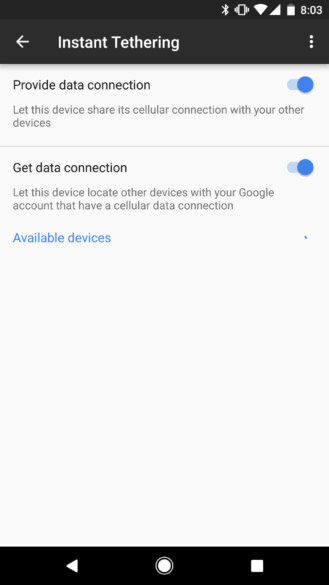 Available only for Pixel and Nexus devices that run on Android Nougat 7.1.1, enabling the Instant Tethering feature will cause all devices that are registered under your Google account to automatically prompt if you would like to tether a device that has no internet connection to another that is connected to the internet. Additionally, the prompt to tether the connection will also reveal the battery level of the device, presumably to give you an idea as to how long the devices can be tethered together. There are currently a few limitations that come with Instant Tethering at the moment. Besides the fact that the feature is only available for Pixel and Nexus devices at the moment, only smartphones such as the Pixel can act as WiFi hotspots. While tablets such as the Nexus 9 and Pixel C can be tethered to a device, they cannot be used as hotspots themselves.